Oooh, just checked out the website. I am really looking forward to Meadowsweet 2, and Pure. I am now signed up on the mailing list. Thanks for the great giveaway! I like so many of your fabrics however I think Monaco is my favorite one. Thanks for offering this giveaway. I tweeted this. Thanks for the giveaway! i like your Givaway very match. What a generous give-away! Man, I'm hoping I win. I love Henna Garden in raspberry. I can think of so many fun things to do with this fabric. Beautiful colors !! Great selection - I really love Picnic Parade, especially the "Fireworks" print! Thank you for the giveaway! And I have signed up for your newsletter. Thanks! Scrumptious fabric! I'm all about tweeting on this one. Thanks! www.ingridbarlow.com. Would love, love to win this fabric. I like the Willow Berries-Dusty Pink. So cute! I get the newsletter now too. Forgot to say that I love the cute Monaco Teal scooters. I love Erin McMorris's Sprout from the Wildwood collection. I love the PURE line! Thanks for the giveaway! I love the Anna maria Horner Fabrics! Love Forest Hill in Citrus! And I'm on the newsletter list! I would have to say Summer Song is my favorite, but it's hard to pick from all those cheery colors! Step two- I signed up for the newsletter! I have blogged about the giveaway. Thanks for the fun contest with cute fabric! Since I used to have a scooter (and WISH I still did! ), I have to say my favorite is the Monaluna Monaco Scooters. They're super adorable. I would love to win this giveaway! Meadowsweet II is just gorgeous! I signed up for your newsletter! My favorite fabric in your shop is Nicey Jane "Hello Roses" in olive. Gorgeous collection! I don't tweet or any of that other "stuff", so I have entered only two times! Thanks! I went, I looked, I signed up for the newsletter and became a follower. My favorite fabric I saw was Summwr Song, I almost bought some but resisted the temptation. 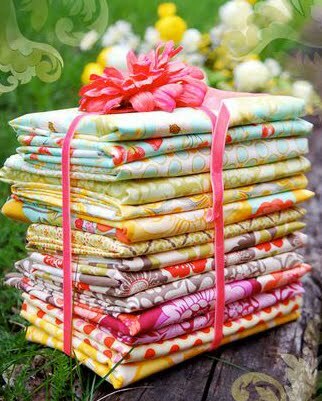 I do love the fabric bundle for this giveaway and would enjoy having it. Great Giveaway! Fav fabric has to be Laura Gunn Big poppies. Not too much arm twisting for me to sign up for the newsletter! Great site! I love Blush! Also, Meadowsweet 2 is gorgeous! Great site which I had never heard about before. Thanks for "enabling me" with my fabric browsing! All my favorite modern designers at one place...yikes. I am actually in love with the meadowsweet 2 since seeig the baby quilt that Heather of alamode made, especially Geranium Splashy Rose. I have signed up for the newsletter. Thanks! I love this site, it's just my taste! I would pick anything from the Pillow and Maxfield line! Love those colors. I'm a subscriber to the Above All Fabrics Newsletter. What a beautiful store! I think my favorite is the groovy guitar fabric. My husband is an amateur guitar player and it would be fun to make him a quilt with that fabric! What a wonderful site. I love ALL the organic fabric!! The are all wonderful but I love the meadowsweet 2 the best. I love the freebird and have already made a baby quilt with it. Thanks for the giveaway and ideas. ...and I also did some shopping at the Above All Fabrics shop- thank you for the discount code! So tough to choose a favorite fabric but I'm really loving the Monaco Double Dot in Teal! I love Make Life and am also a fan of Nicey Jane. "Above All" is a new site to me. Great give away...hope I'm a winner. my current favorite is Monaco by Monaluna. Love it! I love all the fun fabric! I really enjoyed the Farmer's Market Pink Petal Party! thanks! Speckle Henna Garden from the What's New Section is a beauty to me! !Lovely shop! Signed up to the newsletter!! I have signed up for the newsletter!!! I crave the Monaco...especially the scooters. I have to have it! I am liking the "ginger blossom" a lot. Thanks for heads up on this shop. I am bookmarking it right now!!!! I love Monaco and Just Dreamy..I love them all..!! I sent an email to all quilters in my address book! PS I put in my email for the newsletter and it said it was invalid. I 'x'd' out and did it again and it still said it was invalid! Cute! I think the Forest-Green is adorable! Why Sandi Henderson's beautiful fabrics! Boy, those are some gorgeous fabrics! Yes, I signed up to receive their newsletter... and do look forward to them. They have a most comprehensive collection of some wonderful designer fabrics! Love it! Thank you very much! thanks for the opportunity to win such a wonderful group of fabrics! absolutely love 2d zoo pool! I love the Anna Mario Horner Coloring Garden, most of all in Dusk (but it was a tough call). Signed up for the newsletter- what a great re-design! & signed up for the newsletter! My favorite fabric at Above All Fabric is Heather Bailey's Swing Toss in pink. This whole line of fabric is so pretty & so soft to the touch! I signed up for the newsletter to Above All Fabric! Already have visited this site several times! I LOVE the Scooters in TEAL from Monaco by Monaluna. I signed up for the newsletter...hmmmm, I think I might already be signed up. mingle yellow ... love it! haven't seen that fabric til tonight! signed up on their mailing list ... yay! Oooh I am Meadowsweet's biggest fan and I just love the new Meadowsweet 2! Oh my, thanks for the link! Love some of the bundles - and cute names too! My fav would have to be the Beehive Jive bundle, in particular the cute bee print! I like the Freebird Outdoors - so funky! Love, love, LOVE the Monaco collection. The birds are too cute! Reminds me of my wedding design. My favourite fabric is definitely the Monaco collection. Thanks for the giveaway! I like the Blue Hill Line...new to me! Opps, commented twice on #1- but signed up for newsletter. Don't tweet or blog. I also am loving the midnight bubbles fabric. I already subscribe to Above All. I love the Monaco set, the colors are so fresh and those scooters are so cute. Holy Cow so many amazing Fabrics it is hard to choose. The one that stuck out to me is Ocean Breeze the color is so soothing and relaxing. I am now happily signed up for their newsletter, I also put a link on my blog http://sandy-miss.blogspot.com/ Here is it if you want to check it out. Have a good day. I've signed up for the news letter. Starling is cute but I'm afraid it's only one of many faves. Thanks for the chance to win. Yummy site. Thanks for the introduction. I love their Coffee Liqueur fabric. I signed up for their newsletter. Looking forward to it! It is so hard to pick just one favorite, but the one that stands out to me right now would have to be Flower Shower from the Happy Tones collection. It is so cheery! I am now a receiver of the Above All Fabrics newsletter! Limeade Peony Plaid is my favorite... so fun!!! Thanks for the opportunity... I just signed up for your email. So many lovely prints that it is hard to choose just one. I think the 2D-Zoo Pool is so neat. The Garden Geranium Twill is lovely. Love that shop! The new knits by Patty Young/Michael Miller are by far my favorite. I want to get some so badly, but really have to finish a ton of projects before I can. Great giveaway--thank you!!! Signed up for Above All's newsletter! I love their great mix of designers! I love the poppy line! Love the meadowsweet 2 collection. Mingle - Pink is my favorite! I really like the Party Dress line of fabric at Above All Fabric. It's super girly and pretty. I signed up for the Above All Fabric newsletter! My favorite fabric is M.Millers' Meadowsweet fabric called Peony Plaid. It is just gorgeous! I signed up for the newsletter on all fabric's site. I browsed around and fell in love with Bird Swing from Michael Miller. So cute! i CAN'T pick a favorite, I love so many! but i do so desperately love the speckle henna garden by sandi henderson. love it! I just tweeted about this great giveaway from all fabrics. I love all the Michael Miller knits. Gorgeous. ok, so it's not technically a fabric, but i love love love that picnic lunch pattern on their site! I'm in love with Cherish - Essence from Moda's Blush line. It's simply beautiful. Thanks for the new fabric site...I am thinking that it really would be easier to give up chocolate rather than fabric purchases!!! I love the monaco scooters, great fabric. Thanks for the wonderful giveaway!! There are a ton I like under "Novelty"... 2D Zoo in Pool, and Groovy Guitar, for example. Really cute! Also, I just signed up for the newsletter. Thanks! loving the Bloom and Grow fabrics. Very pretty. Thanks for the links! I have signed up for the newsletter! Thanks!